Are you finding rat droppings in the basement or in the attic of your home? If so, then you may have a rodent problem. 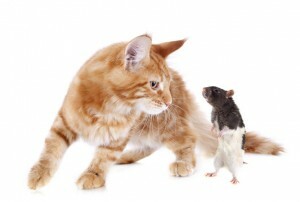 Rats can be a nuisance when they come in close proximity to humans. In addition to spreading disease to both humans and pets, they can cause property damage and contaminate food as well. Rats are members of the rodent family and are larger than mice in appearance. Their bodies measure between 6-10 inches in length, depending on the type of rat, and weigh less than 1 lb. each. Although rats are found in homes less often than mice, all they need is a hole the size of a quarter to fit in. They will get into any openings they can dig their heads in, including chimney flues, garage doors, roof vents, loose sidings, fireplaces, and soffit gaps. They can also gnaw through roof’s shingles, overhangs, and areas where two roofs meet. Crevices in the chimney, loose bricks, and places where water lines and wires enter the home are all entry points for rats. Once rats find their home, they can make a mess and cause damage that could cost hundreds of dollars to fix. They have no problem living alongside humans. The holes they use for entry will become a possible place for leaks to form and passageways for other rodents, insects, and honeybees to enter through. That’s why it is important to call rodent control experts immediately and begin the process of rat removal as soon as possible. Rats are very easy to detect and leave lots of evidence around the home. They chew cereal boxes or dried foods in plastic bags. Chewing marks on woodwork and pipes are also signs of a rat infestation. Dark brown droppings are also commonly found where they eat. If you are quiet enough, you can hear them chewing and moving. Rats have babies frequently, so it is important to find and get rid of them quickly. Even if you do not see the rodent, the size of the droppings can tell you what type it is. Rat droppings can measure up to 19 mm in length. The best way to get rid of rats is to use traps. You can purchase several traps and lure them with peanut butter mixed with oats, dried fruits, and/or cheese. Set the traps at a right angle (90 degrees) to the walls where the rodents are known to travel, with the bait side of the trap toward the wall. When captured, don’t use bare hands to remove the rodent. Wear gloves or use a plastic bag to get rid of the trapped rodent. Once removed, disinfect the trap with bleach and water and reuse. If you’re finding that the traps are still not working and the rats are still causing damage to your home, despite your initiatives, it may be time to call the experts. The longer you wait, the harder it will be to contain the problem and breeding. Seal your air conditioner lines and other gaps that are a quarter in size. If you have any questions about prevention methods and the removal of rats and other rodents, contact at AnyPest at 1-855-886-7378. Any Pest is a leader in providing environmentally safe, reliable, and superior pest control with the highest standards of professionalism and performance. This entry was posted in Blog on 2014/10/20 by Any Pest.